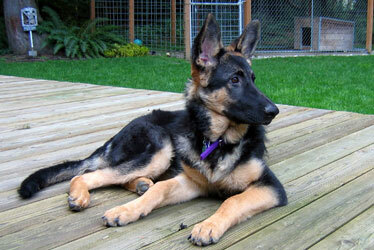 May 2008: Total German Shepherd Newsletter - Want to learn more about the German Shepherd Dog? Read on, here is the best German Shepherd Dog information available on the web, and all in one place, just for you and your German Shepherd. Just a while back I took one of my German Shepherds to the Vet for a problem with excessive diarrhea. In the back of my mind I knew from previous experiences that I would soon be sick, too (from the vet bill I knew I would soon have to pay). After several tests, hours in the clinic and multiple "oops" cleanups the vet gave me a few pills and recommended some Pepto Bismol! Way over $150 for that? While I was glad to get the pills I do have Pepto at home. For more info, contact us at our contact form on our website at any time, or you can send them to us directly at: "gsdphotos (AT) rock DOT com" .